Here are some unique unique diamond engagement ring styles to consider. If you have an idea for a custom design, contact us and we will be happy to design it for you at a truly wholesale price. One of our top sellers, this bezel set engagement ring design with pave set diamonds will surely stand out in the crowd! A master craftsmanship with twisting infinity shank and premium side diamonds. This three-stone princess cut diamond engagement ring will surely make her say "Yes"! Beautiful designed two tone swirl engagement ring with an ideal cut center diamond. This design brings together white and rose gold to make a bold presentation - a truly unique master piece! Unique split shank engagement ring elegantly designed to perfection and can be customized in white, yellow or rose gold as well as platinum. Several price range options as available. A true head-turner. 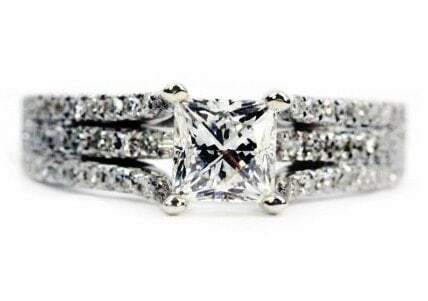 There are not many princess cut diamond engagement ring designs that would compete with this masterpiece. Halo design with pave diamonds and eagle prongs. This vintage inspired unique halo diamond engagement ring can also be customized in yellow ro white gold as well as platinum. Several price options to choose from! 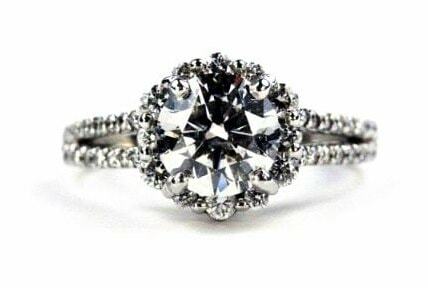 Exceptional vintage style halo engagement ring with amazing details and craftsmanship. An excellent choice for someone who is looking to blend in style with heritage. This is one of our top exquisite halo engagement ring available in gold and platinum. Swirl and halo engagement rings are trending these days, and this setting beautifully integrates both to make a bold presentation. 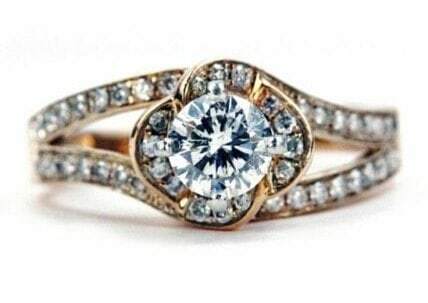 Elegant designed unique vintage classic style engagement ring in yellow gold. It can also be designed in white or rose gold and platinum. A top notch design. If you want something to look out in the crowd, this might be it for you. A truly antique and master piece. The halo round cut diamonds significantly enhances the aesthetics of the center stone. Vintage inspired antique cushion cut engagement ring with diamonds and sapphires. 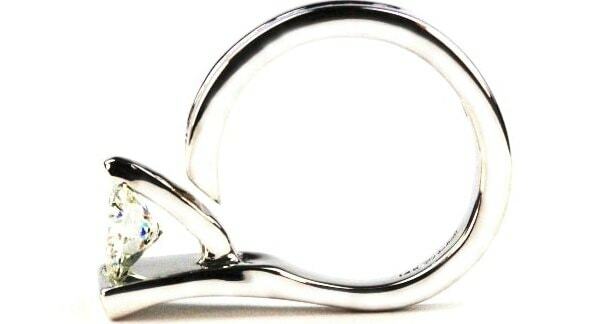 These infinity swirl style engagement rings are trending these days and are very popular. There are variety of designs available and each can be customized. Most of our customers love these styles. This is a very poplar halo design set with pave round diamonds available in rose, white and yellow gold as well as in platinum. This halo design particularly looks beautiful in a rose gold setting. This engagement ring combines vintage and classic style with modern designs. If you want a fusion of old and new, this style might be it for you. It also comes with two matching wedding bands. It can also be customized for other shape diamonds. It is unique and beautiful. 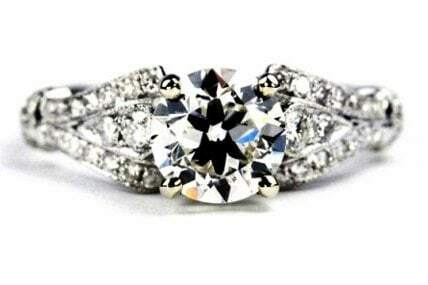 If you have a small diamond/budget, considering a double halo engagement ring might not be a bad idea. This setting can also be designed in cushion halo style. Modern design of the classic solitaire engagement ring designed to perfection. Unique design and solid wide shank made to last. Exceptional craftsmanship! Pave set, this princess cut diamond engagement ring will stand out in the crowd. The center diamond set high making it very visible. A unique design for a lucky princess! Diamond ring with double prongs and cushion halo design - a beautiful contemporary design. This is a beautiful style that combines classic and vintage styles to make a powerful presentation. The baguette diamonds particularly enhances the beauty of this engagement ring. Very popular rings and designs. They have an elegant look and are a good upgrade to the classics designs! A truly exquisite halo design with a split shank. Definitely a style to be on a short list! This three stone cathedral style engagement ring is popular for so many reasons. Not only it shows the center diamond from far away, it also beautifully combines classic and vintage styles with modern designs. Unique cushion cut diamond engagement ring design with four round side diamonds. 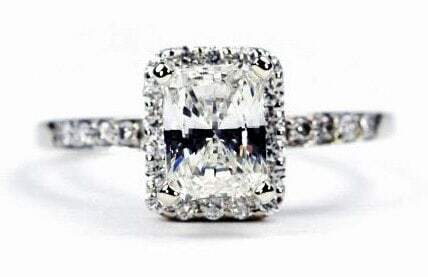 Cushion cut diamonds have incredible fire and are a good alternative to round diamonds if you want something different. A split shank design with a unique touch. The cushion halo also enhance the beauty of this style. With four double prongs, this halo engagement ring will definitely standout among most halo designs. One of our top contenders. Very popular, unique halo cushion style engagement ring set with pave diamonds and center round stone. A classic modern design holding a brilliant cut cushion shape diamond. 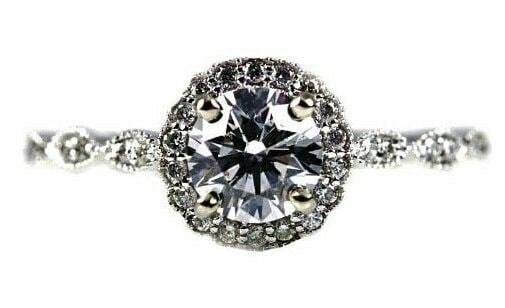 Unique round style halo engagement ring with round side diamonds and double prongs. Unique emerald vintage style engagement ring with exceptional details and brilliance. Unique half bezel set split shank engagement ring set with brilliant natural diamonds. Round modern contemporary design - halo diamond engagement ring with brilliant details and craftsmanship. Unique oval halo engagement ring in rose gold setting. This setting is also offered in white and yellow gold as well as in platinum. This masterpiece is exceptional on so many levels - if you want something entirely different and stylish, this kite style engagement ring should be one of your top choices. Infinity style halo rose and white gold engagement ring. Simple yet sophisticated! This is a very elegant engagement ring design. The simplicity of the one carat round diamonds significantly enhances the beauty of this setting. If you are looking for something entirely antique, these engagement ring styles might not be a bad choice. If you have a even more antique design in mind, contact us and we will work with you to make it a reality. Here is an other unique setting to consider. It should definitely be something on your short list if you want a flower halo design that is very antique looking. Channel set engagement rings are relatively popular and there a variety of styles available. Contact us if you have a particular preference. Simple, yet beautiful. 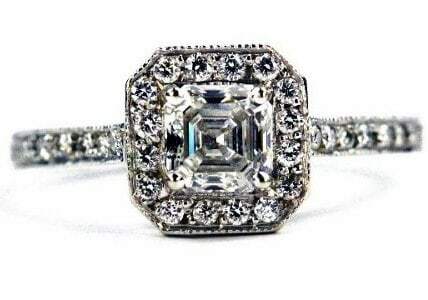 Asscher and emerald cut diamonds are very unique and different! This design can also be customized for any other square shape diamonds. Radiant cut diamonds are beautiful and they look exquisite in halo settings. Three stone engagement rings are also very popular. This one happens to be one of our top selection. 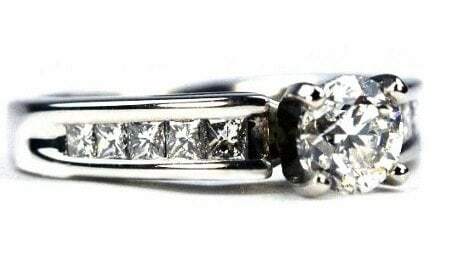 This is a traditional 4 prongs style engagement ring with side channel set diamonds. 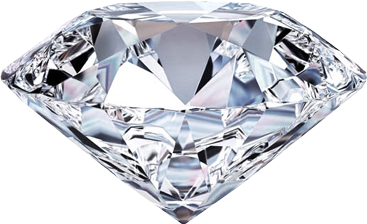 If you have a well cut diamond, consider this design. These five stone settings are famous for wedding bands, but can be considered for an engagement ring as well. This ring goes very well with a matching five stone wedding band of either round or princess cut diamonds, especially a channel set one. A unique design to consider. If you have a nice diamond and like the simplicity of an engagement ring, this might not be a bad idea. It happens to be one of the most popular engagement rings with traditional six prongs. These settings or semi mounts are also available in white gold and platinum. 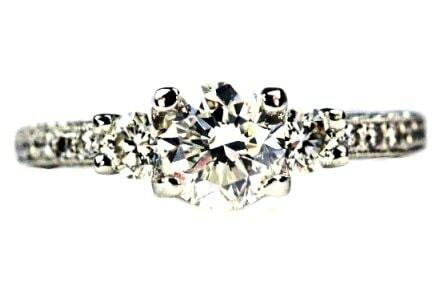 Four prongs classic platinum engagement ring . A very common design - simple yet perfect for an ideal cut diamond. 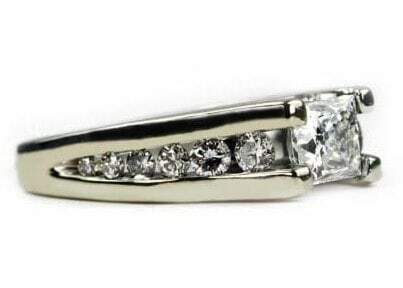 V prongs are important for princess cut diamonds as they are prone to chipping and the v prongs protects them. Engagement is one of the most special moments in our lives. It marks the beginning of a melodious and a memorious journey. Style is often an important aspect of this journey as it strengthens our affection and desire towards our partners. Diamond is a symbol of love, eternity, passion and emotions. It represents a desire of attachment and affection towards your partner that you have chosen for yourself. It could represent the warmth of your relation and a true devotion towards your partner. Halo Engagement Rings: these engagement ring styles are among the most popular these days. The central diamond in a Halo Engagement Ring is surrounded by mini diamonds that glorify not only themselves but also the central gemstone. This makes it a very different ring and of course a special one for your partner. It’s liked by girls who are very fast forward in the fashion and design world. While choosing a ring for your partner, you need to have a strong idea about the lifestyle and personality of your partner. A simple person may like a solitaire ring whereas an unconventional of fast fashion lover might like a halo design. Swirl Diamond Engagement Rings: These rings are ideal for individuals that are looking for uniqueness in a ring. Swirl engagement rings that represent infinity are particularly popular among consumers. Solitaire Engagement Rings: usually engagement rings with one center diamond are called solitaire rings. These are the most famous type of engagement rings. This is because the one central diamond, set high with prominence, demonstrates singularity and closeness between couples. Also, the diamond set in the middle of the ring and situated higher increases the magnificence of the ring, giving it an elegant and a royal look. Therefore, it’s very well suited to women of classic style and royal touch. Channel Set Engagement Rings: channel style rings are also becoming increasing popular as they are very crisp yet have simplicity, style, class, and quality all engraved in one ring. Trinity or Trilogy Engagement Rings: These engagement rings are considered to represent three things about you i.e. your past, present and future, as deducible from its name. Therefore, it has three basic diamonds or one diamond and two color gemstones/birth stones one to each side. Girls with typifying/symbolizing personalities could be great candidate for this type of rings. Cathedral Engagement Rings: These engagement rings have a very different but protective style that make them good for working women who want to keep their rings all the time. Vintage Engagement Rings: Vintage rings are one of the most romantic styles of diamond engagement rings that sell high in the diamond market and make many romantic couples satisfied. It engraves many diamonds in several curled and wavy styles giving it a prestigious look that’s honored by the recipient of this precious type of ring. Engagement Rings with Colored Gemstones: there are usually a row of colored stones that surround the center diamond increasing the prominence of diamond. These types of ring are very good for girls with a unique sense of style – style is the key factor in these rings. Over the past few years, halo engagement rings have had a serious increase in popularity, with everyone from celebrities and even royalty having taken completely to the style. Basically, the halo engagement ring is a type of setting where a center gemstone is surrounded by several much smaller diamonds, although some styles utilize a distinctive metal halo. The halo engagement ring is deliberately designed to enhance and highlight the beauty of the center stone, with features like cut, clarity and size all gaining a boost in visual appeal. Apart from their distinctive exquisiteness, halo engagement rings are a style that will connect you to a rich history. The style has its origins in the Gregorian Era where the center gemstone was usually surrounded by slightly smaller round diamonds or pearls. In the Victorian Era, some modifications were made to the style, with a number of other gemstones gaining popularity for the center setting. The popular choices included: blue sapphires, rubies, turquoise and chrysoberyls. The center gems in this Era were also larger than those of the Gregorian Era. After the Victorian Era came the Aesthetic period, which witnessed a marked return to the simplicity of the Gregorian Era with substantial increases in the decorative effects added to the rings, usually of a symbolic nature. The Art Noveau Movement overlapped with this era and saw popularity shifting towards colored semi-precious stones being the center-pieces of the rings. Also, there was a tendency to place the central gem in an ornate setting made completely of metal, as opposed to diamonds. With the dawn of the Edwardian Era came a massive reduction in the popularity of the colored stones that were the mainstay of the Art Noveau period. Platinum and diamonds became the norm, while complete metal surrounds continued, though the use of small diamonds took up. Pearls were no longer a trendy choice for rings and north-to-south styles began to gain traction. These types of rings featured as many as three large stones set in a row, with smaller stones surrounding them in elaborate architectural designs. The subsequent period, the Art Deco Era, is the one where what is classically referred to as the halo engagement ring emerged. There was an increased emphasis on geometric patterns as well as symmetry, which made the concentric circles that can be found in a halo setting very attractive to the aesthetics of the time. The great depression swept away the opulence and geometric shapes of the Art Deco Era, at least until the Hollywood Glamour of the 1930s and 1940s emerged, resulting in an uptake of large colored stones. The halo engagement rings during this period contained a synthesis of elements from the previous eras. With the onset of the 1950s, square-shaped mounts grew in popularity and North-to-south arrangements gave way to East-to-west settings. In the 1960s and 1970s, there was a substantial increase in the usage of halo engagement rings, with the popular style being of a round stone surrounded by smaller round stones in order to give the appearance of a daisy flower. Fast forward to today and the classic halo engagement ring style has returned fully, incorporating new styles: A square cut stone surrounded by pave diamonds, as well as the new double-halo style that is currently experiencing a fast growth in popularity. In essence, whichever style of the halo engagement ring that you decide on, you can be sure that it places you right in the center of a vibrant, distinctive history, much like the center stone itself! The name “classic” is used to describe any design that has solid aesthetic values and has gained and retained massive popularity over time. When searching for the perfect engagement ring to present to your intended bride, there are a lot of styles that you can choose from today. From the new, trendy styles to the antique and vintage rings of yesteryears. Somewhere in the middle, and the sweet spot for a lot of people, are classic engagement rings. These rings exude all the timeless exquisiteness of vintage styles, while retaining all the elegance and other benefits of a more recent style. Classic engagement rings can also be the answer when you are simply unsure what type of ring she would like simply because most people like them, which is part of why they are referred to as classics. The undying popularity of classic engagement rings is reflected in the fact that their sales make up almost half of all rings sold. They reflect sound, elegant but not necessarily adventurous taste. One of the most popular style of engagement rings that falls in the classic category is the solitaire engagement ring. They are yet to go out of style since been introduced and have been used by intending grooms to propose on countless occasions. Mostly successfully. In order to ensure that your solitaire diamond engagement ring is properly made and fit for your lovely bride to be to wear, there are two basic parts (apart from the diamond itself) that you have to keep in mind and pay particular attention to when choosing a ring or having one made: Setting and metal. The setting is divided into two parts that are interchangeable and are combined in varying styles in order to find the arrangement that best suits your requirements and ideal of the diamond engagement ring you wish to buy. Generally, the goal is to find and arrangement that holds the diamond securely as well as highlights and showcases its best features. The basket is very integral to the safety of the setting. It is made up of four or six claws (prongs) that are either wire or cut off types. Wire baskets are the lightest and most open, making them the most popular choice for people setting up their solitaire diamond engagement rings. There is a popular, but mistaken belief that the wire setting will allow more light to flow through the stone, thereby improving its appearance. This is wrong because a well-cut diamond will reflect back light that enters from its crown, regardless of any light coming from the back. Well cut diamonds will have the same light performance in either setting. The openness is still of advantage though, as it allows better maintenance in that it holds less grease and is more accessible for cleaning. There is a fine balance between the size of the diamond itself, the thickness of the prongs and the type of metal they are made of. The goal is to achieve a setting where the prongs are as discreet and less visible as possible, without compromising on the strength, for safety’s sake. This means that although the prongs are often delicate and thin, they are made of very strong metal. Gold is the classic metal used for this purpose, particularly white gold alloys. At the same time, it is important to take into consideration that platinum and palladium will allow at least 20% reduction in the thickness of the prongs. While using platinum would result in a noticeable increase in cost, palladium is a viable and more affordable alternative that can sometimes even be gotten for less than the cost of 18k white gold. Over the past few years, there has been a marked surge in the popularity of vintage rings. While contemporary rings offer beauty and trendiness, more and more people are drawn towards vintage and antique rings for their timeless class, as well as the feeling of wearing, and being part of history that only antique jewelry can provide. A true vintage engagement ring is one that is between thirty and 50 years old. Engagement rings that are older than this are technically referred to as antiques, though you might find them being sold together under the same name. A lot of people are attracted to these types of rings because of the vast array of styles available and the certainty of fining one that matches their personality, as opposed to the mass-produced engagement rings of contemporary times. Also, they are considered to be of somewhat higher quality than contemporary ones. Antique jewelry, by virtue of being as old as they are, are not very common items and very rarely will one come across matching pieces. Vintage engagement rings span across a multitude of styles and designs over many eras. They are vastly different from contemporary styles and being unique and one of a kind, they automatically make the wearer stand out as someone with painstakingly good taste. If your partner has an outgoing personality that likes to be distinctive and apart from the crowd, then you should be seriously considering a vintage engagement ring. These days, goods that are handcrafted are considered to be of superior quality and value to mass-produced ones. The same rule applies when it comes to engagement rings. As opposed to contemporary rings that are often mass-produced in generic and very similar styles, vintage engagement rings were generally produced individually in the hands of a skilled jeweler. This difference becomes very manifest when one compares a contemporary engagement ring with a vintage one; while the one from today is plain, the vintage engagement ring will often have intricate and distinctive designs that reflect the specific time period in which it was created. 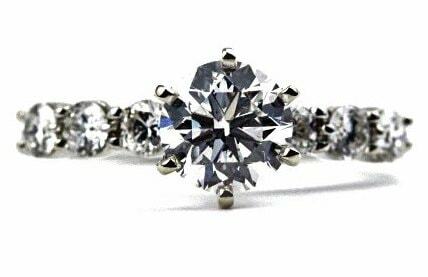 Although a valid argument can be made that today’s advanced manufacturing processes actually increase quality, the human touch of vintage engagement rings will definitely shine through. The decades or even centuries of history that is embedded in a single vintage engagement ring is one of the factors that make them so attractive to couples. If you know the complete history of the ring, the knowledge will give you a connection to a time far in the past. If you do not, the significance can be left to your imagination. Either way, you have a piece of history around your finger. In choosing a vintage engagement ring, you should take the time to consider the various eras from which those rings are frequently sourced in order to find the one era you like the most and which holds the most significance for you or your partner. If you’re passionate about the environment and are “going green” in other areas, you should consider the fact that the rate at which jewelry is produced around the world today definitely has a considerable effect on the environment. From the depletion of natural resources to the energy required for processing. Vintage engagement rings give you a chance to play a role in preserving our environment. Please contact us and we will be happy to assist you in identifying the best intage engagement ring for you at a wholesale price through our partners and wholesalers. The engagement ring is a common physical token of a commitment in a marriage. It has been a tradition practiced in many cultures and countries throughout history, although the original tokens of engagement did not in any way resemble the diamond ring that is currently the symbol for engagement. There have been many forms and objects that people used to express willingness and commitment to get engaged. Some of these do not even come close to being romantic expressions of love and commitment, but rather marks of ownership, a form of payment, or a way of identification. This article will show the evolution of the symbolic engagement ring and what such symbols meant. In prehistoric times, the man used to tie grass around his wife-to-be wrists and ankles as a means of protection from evil spirits. This is also similar to a recent African tradition of tying the bride and groom’s wrists together using grass strands. It was the Romans who first began to use plain iron bands as engagement rings. It was typically worn on the fourth finger on the woman’s left hand, because it was believed that a vein in this finger traveled directly to her heart. It was customary then for the men to give gold rings for their bride-to-be to wear during the wedding and during special occasions, and another one made of iron for her to wear every day. In ancient Egypt, however, rings made of costly metals were ordinarily used as a currency for trade, and a man who placed a ring upon his wife’s finger meant that he trusted her with his wealth. Similarly in medieval days, the ring also served as some sort of dowry or payment for a wife. In the Middle East in Asia, puzzle rings were given by sultans and sheiks to each of their brides. This was their way of “tagging” their many wives, and a way of ensuring their loyalty to their husband. The first recorded incident of wholesale engagement ring containing a diamond was in 1477. The Archduke Maximilian of Austria pledged his love and commitment to marry his beloved Mary of Burgundy with a gold ring decorated with diamonds making the shape of the lady’s initial, M. It was only two years later when another royal, Constanzo Sforza gifted his bride, Camilla d’Aragona, with a diamond ring on the day of their wedding. It was no surprise that only men from wealthy families and royalty were capable of presenting diamond rings to their beloved as these stones were a precious and rare commodity and highly expensive. In the 1700s, engagement rings called “posie rings” containing lines of poetry and messages of love carved on the inside of the ring were exchanged by lovers. These were initially silver bands, which were replaced with gold ones during the wedding. For the Hebrews, rings made of gold or silver were the norm, while in Northern Europe, gold, silver, and copper were the metals of choice. It was only in the 1800s when gems and decorative stones were incorporated into engagement rings in Europe. Rings with endearing words like Love, Eternity, and Forever spelled out with jewels became fashionable during the 1800s. But it wasn’t only precious stones and metals that the highly romantic and sentimental Victorians used to make their jewelries. They were also using their beloved’s hair along with the gemstones and precious metals. All of this romanticism with regards to engagement was greatly influenced by Queen Victoria, who at the time was herself madly in love with her husband, an uncommon thing with arranged marriages among royalty of this period. It was also during the latter part of this period when diamonds and precious gems were discovered in a mine in Cape Colony in South Africa, effectively increasing the supply of the highly valued gem in the world. It was also during this time, around d 1886, when Tiffany & Co. first released its Tiffany setting, a band with a diamond raised on a six-prong mount which maximized the diamond’s brilliance and cut. Since then, engagement rings have taken on this design, and this has become the preference of women all over the world. The sale of diamonds declined in the 1930s during the lean economic times. De Beers, the sole diamond mining and manufacturing company operating the newly discovered mines in Africa at the time, launched an aggressive campaign to boost the sales of diamonds again. They launched the classic slogan, “A Diamonds is Forever” and immediately saw a boost in their sales. The connotation between marriage and a diamond being indestructible became deeply ingrained in the American psyche with the popularity of this new slogan. It is no surprise then that in most department stores, engagement rings soon became the best sellers in every jewelry lines. After the rise in popularity of diamond engagement rings, it became a tradition for a man to ask for his lady love’s hand in marriage with a ring. The modern custom of proposing marriage to a woman with a diamond ring has become the standard practice among many countries and cultures around the world. However, there are many countries that still have their own marriage proposal traditions that are unique to their culture. Some of these practices have been overtaken by the western practice, but some of them are still in practice today. Some are relatively new practices that have been adapted from modern innovations and from the sheer creativity of men. Some of these unique marriage proposals are mentioned below as they are practiced by different cultures or regions around the world. A new style of proposing marriage is on the rise in many modern countries in Asia. This is known as the flash mob proposal, where a group of people collaborate with the future groom who makes his proposal with a song, and dance, or any other production that involves a big crowd. In India and Pakistan, where arranged marriages are still practiced, it is not only the bridegroom but his entire family that makes the formal marriage proposal to the bride’s entire family. In some deeply traditional families, the couple themselves are not even involved in the engagement rites at all. In Pakistan, once the bride’s family accepts the proposed marriage, an engagement party ensues where the future groom can propose to the future bride in person. In China, traditional Chinese culture is still deeply ingrained in the marriage preparation rites. Weddings for them are a joining together of not only two individuals but families. Therefore, even if a marriage proposal is initiated by the giving of an engagement ring, traditional practices like the woman introducing the man to her family, the man seeking the blessing from the woman’s family prior to the proposal, and the two families together acknowledging the engagement and casting their blessing of approval upon the couple are all part of the engagement tradition. In Thailand, engagement and wedding traditions and customs are still widely followed by families. A ceremonial rite called “Thong Mun” marks the engagement of a couple. Here, the future groom presents a gift of gold to his prospective bride and her family. This is also followed by dowry negotiations between the two families. In Europe, the tradition of men proposing to women while on one knee, with a ring in hand, is still very much in practice. The engagement ring, however, is normally worn on the third finger of the woman’s left hand as opposed to the common practice in the USA of wearing it on the fourth finger instead. In the UK and Ireland, a peculiar tradition that used to be common is a woman initiating the marriage proposal to the man. This may only be done every leap year, on the 29th of February. This tradition is seldom, if ever, practiced anymore. Among the British, a couple’s engagement must be formally announces through a church bulletin called “the banns.” This served as notice to anyone who may oppose the marriage of the couple, and to give legal reason why the marriage must not take place. In Germany and Sweden, both the bride-to-be and the groom-to-be wear engagement rings during the period of engagement. In Ghana, an old African tradition is still being practiced in engagement rites. This involves knocking on the door of the woman’s home during the proposal visit. The groom-to-be’s mother and uncle are the ones who perform the knock on the door during a visit to the woman’s family when they propose marriage in behalf of the groom. In some Kenyan tribes, a man declares his intent to marry a woman by sending her beads. Keeping the beads means the woman accepts the proposal, after which her family will present her with an adornment to add to these beads to signify their acceptance of the engagement between the two. These are just among the many practices and traditions associated with engagement and marriage. Every culture holds their own views on how a couple’s engagement must proceed, and even with the advent of modern styles and practices, celebrating the engagement between two people always brings families and communities together in one way or another.